First author Christopher Campbell's dog, Lipa. Recombination within the genome isn’t random. This swapping of DNA segments between one chromosome and its homolog preferentially affects specific genome regions called hotspots. These regions can have recombination rates many times higher than other areas of the genome, and the rapid shuffling of genetic information is thought to be important in evolution. The location of these hotspots differs greatly from species to species, even those that are genetically closely related: humans and chimpanzees, for example, have no hotspots in common. One factor that may account for this rapid divergence is the gene PRDM9, which encodes a protein that directs recombination to hotspots. PRDM9’s DNA-binding zinc finger array seems to be under significant selection in many species. But over the course of evolution, some organisms, including the domestic dog, appear to have lost PRDM9 function altogether, which could have a major impact on how recombination events are distributed. 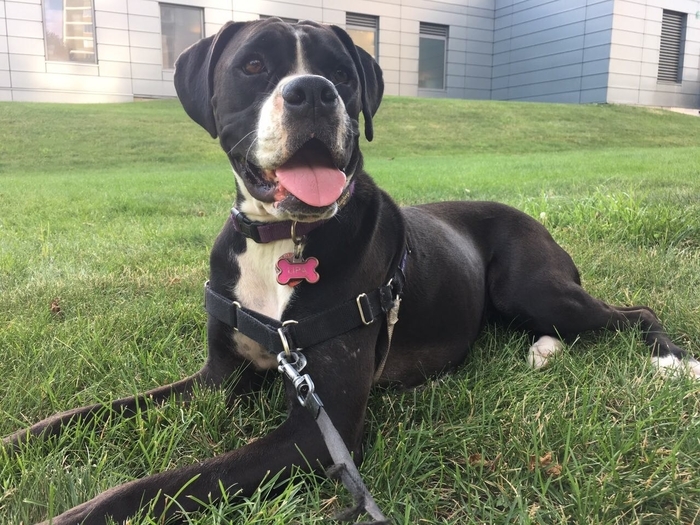 Research published in the November issue of G3 suggests that recombination in dogs is more concentrated within certain regions of the genome compared to some species that retain a working PRDM9 gene, including humans. The researchers’ pedigree-based investigation of Labrador retriever and greyhound lines revealed that recombination in these breeds tends to cluster around functional genetic elements (such as promoters), a trend also seen in other organisms lacking operational PRDM9, including yeast and PRDM9-knockout mice. The increased recombination rate at functional genetic elements suggests a mechanism for hotspot localization in the absence of PRDM9. Such functional regions of the genome are characterized by open chromatin, which could allow factors that mediate recombination better access to the DNA. The results also imply that hotspots in organisms without working PRDM9 may be more stable over time than those of other species. In species with PRDM9, hotspots are defined by a specific sequence motif that is bound by PRDM9 to promote recombination, and recombination events can occasionally disrupt the sequence that made the region a hotspot in the first place. Hotspots in organisms like dogs aren’t set by a specific sequence, so they wouldn’t be whittled away as easily over generations. Future studies of other canids, such as wolves, will provide more insight into recombination in this family—and possibly in other groups that no longer rely on PRDM9 to direct the shuffling of their genomes. Campbell, C.; Bhérer, C.; Morrow, B.; Boyko, A.; Auton, A. A Pedigree-Based Map of Recombination in the Domestic Dog Genome.